Prevent all combat damage that would be dealt this turn. 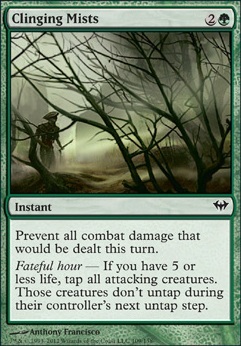 Fateful hour - If you have 5 or less life, tap all attacking creatures. Those creatures don't untap during their controllers next untap step. Also, what about Clinging Mists or Sleep ? Instead of Clinging Mists I suggest Fog because it cost 2 less mana plus there will probably be very little situations where you have 5 or less health.For more land you might want Burgeoning. 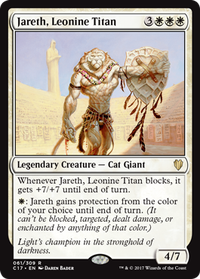 Abundance can be swapped out for AEtherize pretty easily to hose aggro decks a little better. Constant Mists, Spore Frog, Fog Bank can help you against aggro decks. 1v1 the only fast decks that gave me huge issue were Rafiq of the Many and Zurgo Helmsmasher if my starting hand was bad. If they hit their rocks and acceleration they swing for lethal turn 4, but one wrench throws that tempo off balance. Overall I don't see many true to form aggro decks often, most swingy decks tend to peak at around turn 6 (xenagod, kaarthas, samut). 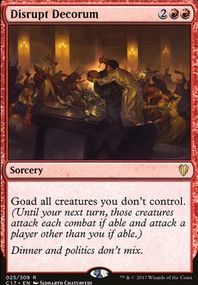 If you feel that sort of thing coming, the best i can recommemd is to hold off playing kruphix until after hosing their tempo or killing/countering their commander. Clinging Mists would be hilarious in this deck. Problem? Bababad on He's better than everyone, Kruphix. I'm going to start listing things like I did on the black deck, these are just notes on several cards that should play together nicely for an Elf Tribal deck. I'll keep it Modern. There are so many elf decks out there that I'm sure whatever I find will have already been found, but I'll keep an eye out for anything unique. Elvish Promenade: I see this deck spreading out wide with many Elves and I'm looking for a way to take advantage of that. The thing about this approach is that even if you never get anything bigger than a 1/1 or a 2/2 like you are aiming for, a whole lot of small creatures can be as good or better than one big one. Promenade will literally double any board state as long as we maintain everything as elves. A 4 mana sorcery won't be a problem. Imperious Perfect: Being your favorite card, it really goes hand in hand with having many elves instead of one big one. A nice generator that basically drops 2/2's. It's not Legendary, so you can stack them up to give everyone up to +4/+4 and be able to add up to 4 5/5 Elf Tokens a turn. Realistically I wouldn't recommend playing more than one or two at a time though because he will be a target and anything that can pick off multiple creatures will kind of ruin you. Depends on who you are playing though. Alpha Authority: I'm thinking sideboard. Not sure on this yet, just marking the page. Animist's Awakening: Another one I'm not quite sure about, but it seems like this could be a beast later on with something like Blanchwood Armor. Arbor Elf: If you go for any land enchantments, use this. If you don't, stick to Elvish Mystic and Llanowar Elves. Aspect of Hydra: This is my favorite quick buff in any mono-green situation. You're devotion should be at least 5+ after the first few turns even if you have a bunch of tokens. 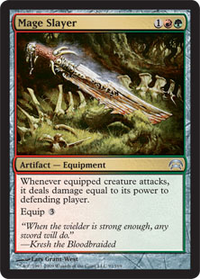 This means attacking with a wide spread and targeting an unblocked creature can yield some massive damage. Assault Formation: Note to self: Look into making a green wall deck. Moving on. Autumn's Veil: Great sideboard card. Biomass Mutation: Radioactive Elves, that's what I see. You can afford a LOT of mana in a deck like this and Mutation hits ALL of your creatures. 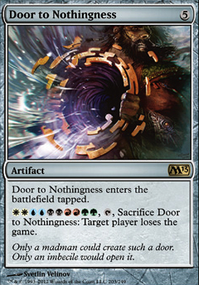 This could actually be a win condition of sorts. Blanchwood Armor: A classic. 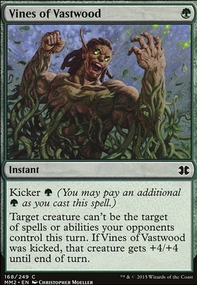 This would go well with Animist's Awakening mid to late game by dropping a whole lot of Forests in one swoop. Blunt the Assault: Fog but with a lot more bite. I don't even care that it's 4 mana. Boundless Realms: Interchangeable with Animist's Awakening. It forces you to pay 7 instead of just any number so I suppose it isn't quite as flexible. Whichever ends up being easier to get your hands on, perhaps. Bow of Nylea: A fun card. Would add a lot of options and deathtouch for all of your attackers would be kind of nuts. At our home game we have a guy that plays a cheap green deck and all of his little creatures have deathtouch. Let me tell you, it's annoying and is very potent since it wipes out an opponents creatures of any size without hesitation. Chorus of Might: Another bomb card that could win the game if you have enough on the table. Would probably only run two in the deck, but this could be big plays. Clinging Mists: Another sideboard option for dire situations. Commune with Nature: Not a bad option. Copperhorn Scout: The closest thing to vigilance, but is especially powerful here since you can attack with all of your mana elves AND tap them for mana for something epic like Biomass Mutation. I like that a lot. Creeping Renaissance: Pick Elf. Well, technically creature. Cryptolith Rite: Makes sure that all of your elves can produce mana. I'd maybe run two of these and bank on that Biomass Mutation + Copperhorn Scout combo. Descendants' Path: Maybe. A free elf. Elves are usually only 1-2 mana anyway. Nevermind. Doubling Season: Powerful, yes. But I'd say another maybe. It would work decently with your Imperious Perfect, but not really all that dynamic. Drove of Elves: Now here is the guy I was looking for. Even tokens are permanents and they absolutely specify the color green. Hexproof is an amazing bonus, but the fact that these aren't +1/+1 counters is even better because it grows as your board state grows. You have to run this guy. Dwynen, Gilt-Leaf Daen: Here's another beast of an elf that plays very well with this deck. Makes everybody stronger like Imperious Perfect, but can also gain you a hell of a lot of life when attacking. Two creatures with stack-able anthem abilities are amazing for this kind of deck too. Dwynen's Elite: Cheap and you get a free token. I'd run 2-4 of these. Early Harvest: Could be big, maybe not. You would have to just try it. Elvish Archdruid: Another big play. I'd run 2-3 of these with 3-4 Elvish Mystics and 3-4 Llanowar Elves. Forget about the Arbor Elf, these are your big mana generators. Elvish Champion: Ok, so who knew there were so many elf anthems in standard? I'm thinking that besides mana elves you could probably just run every other anthem elf and they just buff the hell out of each other just for being on the table. Elvish Branchbender: I actually lol'd when I saw this guy. Holy crap. Elvish Eulogist: Probably sideboard. A nice way to come back if all of your elves just keep getting squashed. Elvish Harbinger: Ok so maybe this works in place of two of those Mystics or Llanowar Elves. It would slow you down slightly because it costs one more but being able to grab whatever other elf from your library and put it into your hand at the same time could be nice. Definitely on the maybeboard. Elvish Hexhunter: Definite sideboard to deal with enchantments and much better artwork/name than Elvish Lyrist. Essence Warden: Good for multiplayer games. Evolution Charm: One of my favorite charms. Pretty good in almost any Mono-Green. 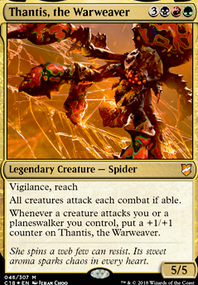 Ezuri, Renegade Leader: Run two of these and call it a day. I think this is plenty of cards at this point, let me put together a condensed list.